I came up with this idea to create a more beginner friendly and 100% new logo & texture pack. This pack contains 175 easily editable pre-made modern blog-styles and minimal logo templates that are in high demand right now! Just add your own text and you’re good to go. One logo is normally worth of tens of dollars each and with this pack you can actually generate thousands of different variations of this logos and textures. The pack also includes 27 handcrafted textures, exclusively designed for logo templates. I’ve got dozens of questionnaires on how to easily create a perfect logo and add a texture in it. I know you might not breath Illustrator and Photoshop for a living, so that’s why I created this pack that is so easy to work with. 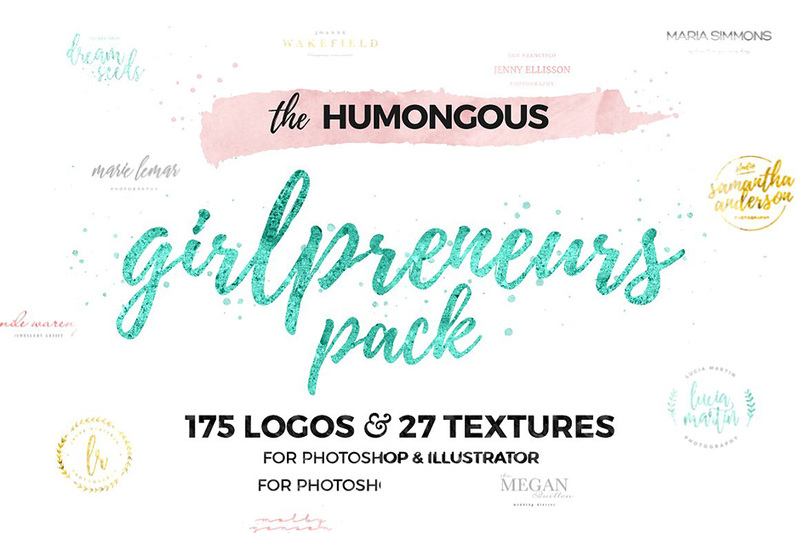 The pack includes two .PDF tutorials on how to add a texture in Illustrator and Photoshop, easy to search catalogs to replicate the texturized logos seen in preview images, super-easy folder management and on top of that, each logo has font download links in an individual text file! This should make it easy for you to create your new logo in less than five minutes. Textures included in this pack are handcrafted by me in my studio with high quality items so they’re 100% unique. There’s glitters, watercolors, inka golds and rough paints included. I’ve made them to match the modern colors like gold, rose gold, salmon pink and glitter mint. I’ve also added my favourite texture “97% Black” in the pack. It’s a hand painted watercolor texture that’s almost black, but still gives a really nice life to logos with its lighter areas. Other textures play really nicely together with it and one of my favourite combinations is to use “Tickling Gold” with it. Another favourite combination is rose gold and mint together. It really gives that modern blog styled sweetness into the logo. These modern, glittery and glamorous logos can be used in multiple businesses like photography, blogging, food business, graphic design, hair stylist, cosmetology, recipes and for any other business! You will get all the 175 pre-made logo templates in .AI and .PSD files. .AI files are 100% vectors, .PSD files are rasterized to high quality (4,167 x 4,167 pixels). You will also get 27 high quality textures. All text areas are fully editable and only free for personal and commercial use fonts used! Total of 53 different fonts used. Just add your own favorite textures or use just in black or white to make your dream logo! • 175 carefully remade logo templates (.AI & .PSD). .PSD files are rasterized to high quality (4,167 x 4,167 pixels). Mix and match templates to create thousand of new logos. • Download package contains font download links. Download links are in individual text files so you don’t have to download all at once if you don’t want to. Only free for personal and commercial use fonts used! Total of 53 free fonts used. • Comes with two text tutorials that quickly shows you how to add the texture in the logos. Instructions for both, Adobe Photoshop and Adobe Illustrator! • 27 bonus textures added in the pack. Multiple different colors in multiple different textures such as glitter, watercolor, inka gold and rough paint. Textures are variable hi-res images and all of them are seamless!! All of them are photographed from real textures, glitters and watercolor hand painted by me. • The pack comes with a .PDF catalog that makes it super-easy to find the logos and what textures were used in the preview images. With help of the tutorial files, recreate the texturized logos in a snap. Everything is perfectly layered in folders and ready to be used! • Works with both of your favorite editing programs Adobe Illustrator and Adobe Photoshop. Textures work with any software that can edit/use .JPG image files. Software compatibility: Adobe Photoshop and Illustrator CS3 and newer. .JPG files will work with most graphic software. File size is approx 403.1MB (750.8MB unzipped), offered as a single download. I love this! I just bought it and have been playing around with it. Thanks so much DC team for selecting this for your site. I’m completely in love – plus, those tutorials are ace. Thank you so much for taking the time to comment and we are so happy to hear you are enjoying this!